Instead of tasting and writing, she first learned the scientific principles of oenology and then how to make wine. After training in major classic regions around the world – Rioja, Ribera del Duero, Priorat, Marlborough, Casablanca and Burgundy – she got a job at Bodegas Arrayán, originally a candidate for becoming a Vino de Pago in Castilla-La Mancha, and which has a top-notch vineyard planted with international varieties. Sánchez did well there, making some very balanced and enjoyable wines that carved out a niche in competitive markets. But her rise to fame came when she convinced the owner to produce Garnacha from very old bush vines in the neighbouring Gredos area. With this move she took a leap into the wild side. Previously her wines had been politically correct, with well-defined fruit, good concentration and textbook balance. 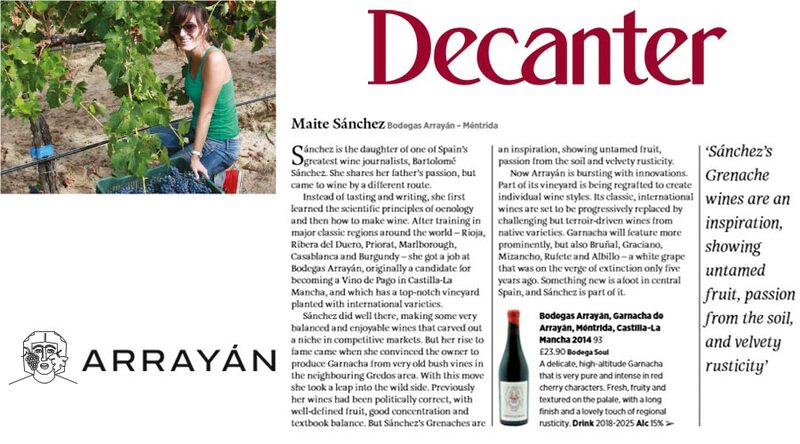 But Sánchez’s Grenaches are an inspiration, showing untamed fruit, passion from the soil and velvety rusticity. Now Arrayán is bursting with innovations. Part of its vineyard is being regrafted to create individual wine styles. Its classic, international wines are set to be progressively replaced by challenging but terroir-driven wines from native varieties. Garnacha will feature more prominently, but also Bruñal, Graciano, Mizancho, Rufete and Albillo – a white grape that was on the verge of extinction only five years ago. Something new is afoot in central Spain, and Sánchez is part of it.